SPOOKY HALLOWEEN MUMMY STROMBOLI — NORTHERN DOUGH CO.
Who’s lurking in your oven?! 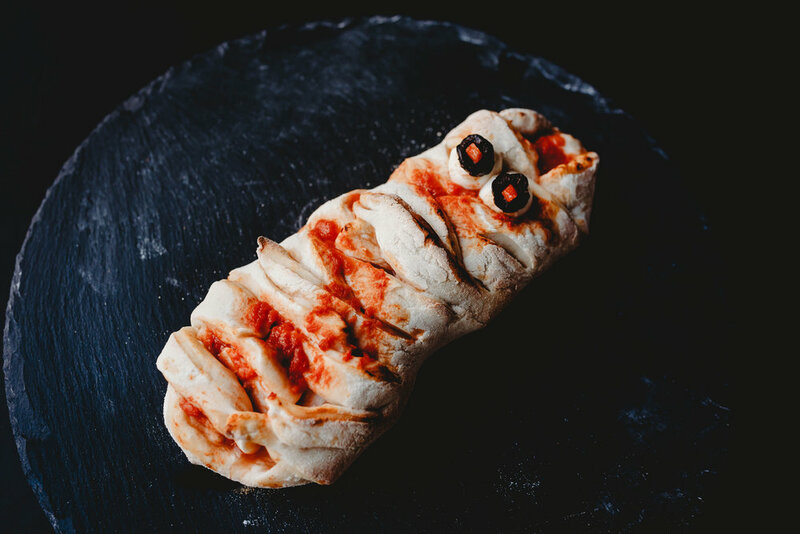 This spooky Halloween Mummy Stromboli is great fun to make, and delicious to eat, get everyone in the kitchen and get stuck in! Move your pizza base to the lightly floured baking tray, and make small cuts down each side of the dough with a sharp knife, approx. 1/3 of the way in, to create strips of around 2cm wide. Spread a tablespoon of the passata over the middle section of the pizza dough, avoiding the very edge closest to the cuts, then add 8 of the mozzarella pearls evenly across the top. 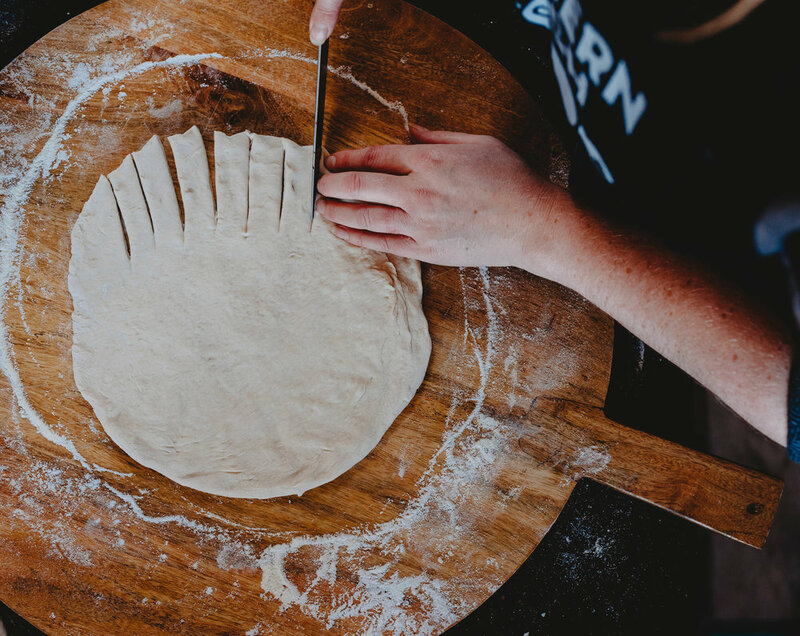 Take the bottom strip of dough and stand it up at a 90 degree angle, then secure it in this position by pushing the corners of the strip into the dough, creating a little lip. Fold all of the strips over the filling, crossing them over at random, sometimes straight, sometimes diagonally so it doesn’t look too uniform. Make the eyes! 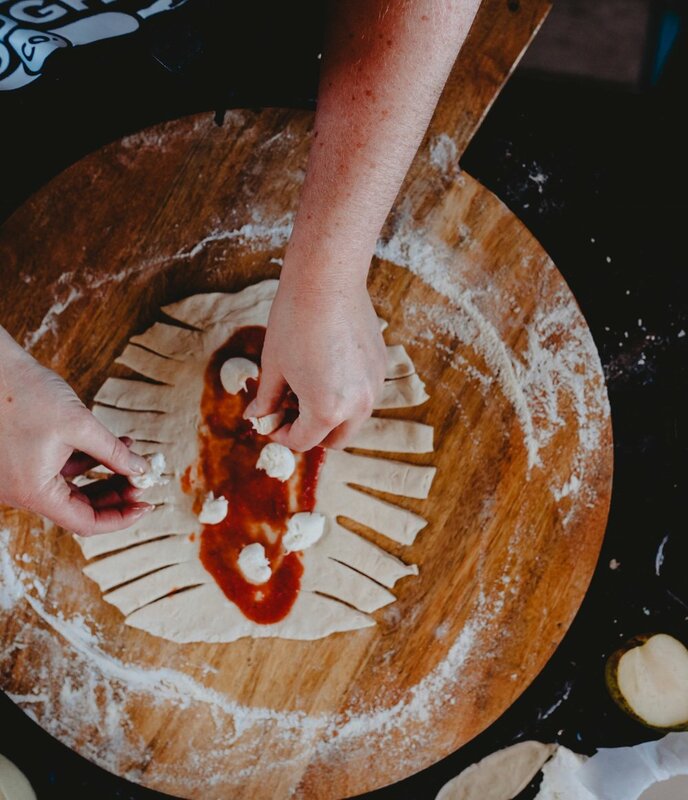 Take the two circular pieces of olive and pop the red piece of pepper (or other veg) into the centres, then place them onto the remaining mozzarella pearls and sit them in one of the folds of the dough so they look like they are peeping out! Move to the hot oven for 10-12 mins or until the sauce is bubbling and the crust has turned golden brown. Remove from the oven and leave to cool for 3-5 mins. As well as preventing burnt mouths, this also helps the toppings to ‘set’ and means they won’t slide when you cut into it! Slice, share and enjoy!